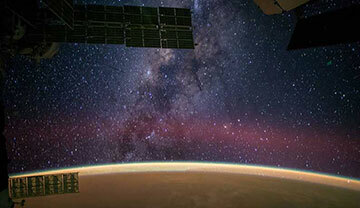 Blog Can you see the Milky Way from the Space Station? Can you see the Milky Way from the Space Station? 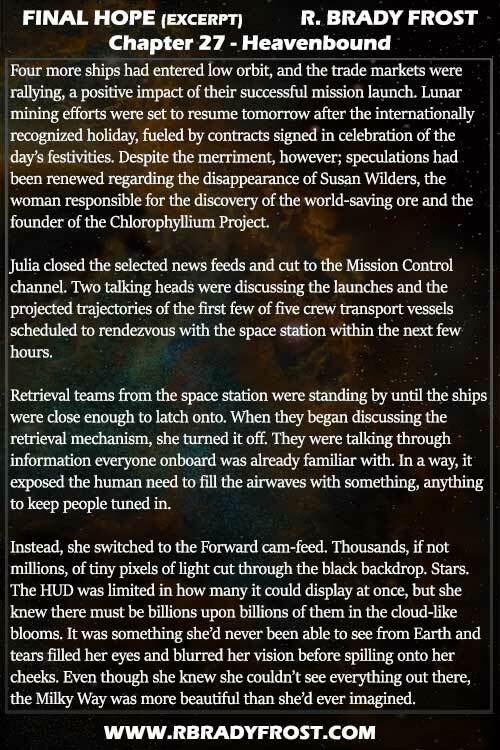 I had just written a passage in Chapter 27 of Final Hope where one of my main characters, Julia Holland, is traveling to the space station. This is where the final ramp up of the Chlorophyllium Project is taking place. That’s when I realized something. I’ve never been to our modern-day space station. Was I failing to represent reality? I had no idea whether Earth reflected enough light to pollute the Milky Way landscape. Better to ask than look like an idiot, I always say. So? Can you see the Milky Way? 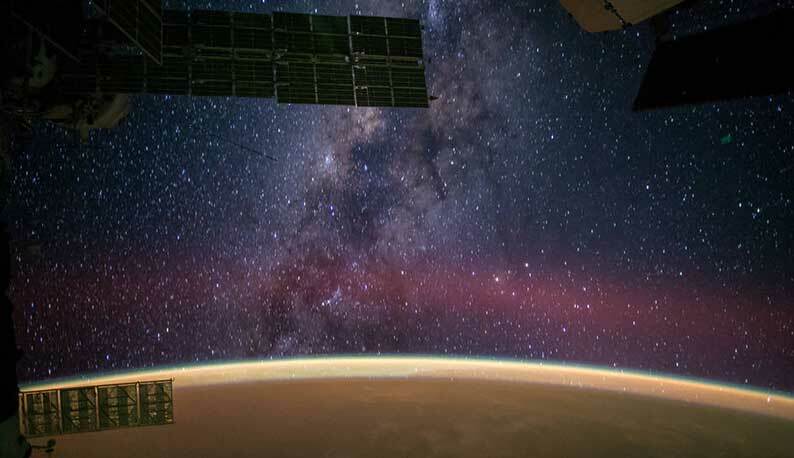 Well, it turns out that you can see the Milky Way from the International Space Station. Thanks to a picture taken by Reid Wiseman and posted to social media and NASA.gov, we can see it’s not only visible, but also just as beautiful as I’d hoped. When I first dreamed up the idea that became Chlorophyllium 9, I envisioned a scenario which took my characters to an unexpected clinch-point. Then the story did so much more than that. What started as a short story has expanded and become something more. It has become something better than I could have possibly expected back in 2008 when I sat, dreaming about the plant-like green ore that could save our world from eventual destruction. It’s been almost two years since I first published the short story, “Chlorophyllium 9.” It’s no longer available on the marketplace, but I plan on releasing it as a short novella entitled, Distant Worlds, and then I will include it in the novel, Final Hope, later this year. For those who read the short story, thank you so much for your patience. The novella is pretty much done, but I want to sync the release so I can offer the novel soon after the launch. The Birth of Final Hope. I’ll be honest with you. Writing this novel has been a complicated process, but I’ve learned so much along the way. The result, I think, has been stronger characters and a building tension that keeps you reading, even though you might think you know where you’re headed. I aimed for the sky and found myself in the stars, but it wasn’t without setbacks or self-doubt. My goal along the way has been to learn from the process, to learn how to write better and produce a quality story faster. Life is full of excuses. We’re all busy and with a full-time career and five kids, there have been many days when I’ve convinced myself that I don’t have enough left in the tank to put words on the page. When I do, it’s been small chunks at a time. I’m working to improve that and to trust in my writing ability. Like I said, it’s a process. One of the themes in Final Hope is that there have been consequences associated with humankind taking their eyes off the stars. In the future, there have been consequences of looking down at their smart devices instead of staring at the sky in wonder like our ancestors once did. Just like my characters, I have to keep looking forward. It’s going to be quite the journey and I hope you’ll join me. There are so many stories to explore and so many questions to ask.